If you have a man-made pond in your backyard, it is important that you keep an eye on the pond to make sure everything is working properly. It can be a terrible feeling to come out to your pond one day and find that most or all of the water has been drained away because of a leak. If you have water plants and fish in the pond, a severe leak could even kill them. Fortunately, if you are vigilant, you can notice these leaks early on and have them fixed. In fact, most people can take care of these repairs on their own without much trouble at all. The following are some DIY pond liner repair tips that can help you keep your pond in great working condition. The first step is to find the source of the leak. While all leaks can be problematic, if you are fortunate, the only issue is having a liner that has slipped. This means that part of the liner has been dislocated from its original position and has slipped into the pond, which will be the source of the leak. If that’s the case, you can generally just move the liner back in place, secure it, and fill the pond back up with water. However, you might not be so lucky. If the liner did not slip, and there is not an issue with the pump, it likely means there is a hole or tear somewhere in the liner. In this case, remove any plants or fish from the pond and keep them somewhere safe. Try to keep them in the water from the pond, so they do not have to try to acclimate to a completely new environment. Once you have removed them from the pond, refill it with water, and then wait for the leaks to stop. The hole will generally be right near the water level and/or above this point. You need to closely inspect the liner to look for any holes and tears. DIY pond liner repairs for holes and tears will utilize patches made from liner material, along with pool liner sealant. You need to clean the area of the holes to make sure there is no debris left behind, and then you can add the patch and cover it with the sealant. Make sure you get all of the holes by double-checking the liner for other issues. Once the patches are dry, you can then replace the liner into the pond and fill it with water. After the water has been returned to the pond, it doesn’t mean your search for leaks is over. You need to make sure the water stays at the appropriate level, and that the patches are holding, before you return your plants and fish. As you can see, DIY pond liner repair is possible, and it tends to be simple, but potentially time-consuming. Keep a close watch on your pond to make sure you catch any future issues as early as possible. Having a man-made pond on your property, whether it is a residential property in a rural setting or the suburbs, or even a commercial property, such as an office park, is always a nice addition. You can create a range of unique ponds, add some plants or wildlife, and essentially create your own little serene oasis. Of course, it is vital that you have a pond that is constructed properly before you ever add any water to it. This includes having the right pond coatings applied properly. What Is a Pond Coating? The coating essentially acts as a barrier between the water that you have in the pond and the concrete below. If you were to simply put water directly into the concrete pond, it will eventually start leaking. The coating works as a means of ensuring your pond does not suffer from these leaks. While there is still the possibility of a leak forming, even with quality pond coatings, the risks are lower. There will be fewer leaks, and they tend to be far smaller and easier to repair. Many types of coatings are on the market today that claim to be waterproof. However, that does not mean they are all suitable for use with your pond. You need to make sure the product you choose is specifically for use within manmade ponds. It not only needs to be waterproof, but it also needs to be non-toxic. If it has toxic chemicals in it, the plants and fish that you put into the pond will likely die, and it could poison wildlife and even pets from the neighborhood that stop by for a drink. The pond coating is simple to apply, fortunately, and you can do the entire project on your own if you wish. Once you have poured the concrete into the hole, you must let it set and cure. If you have used an accelerator in the concrete, this will generally only take about a week. Without an accelerator, it will take upwards of a month. You must wait for it to cure so there is no remaining moisture in the concrete, as this could cause leaks, especially if it gets below freezing in your area during the winter. Once it is set, you will clean the pond to remove any dirt or debris. You need to make sure the coating does not have any debris between it and the concrete, or this could be a source for a leak later. After cleaning thoroughly, you can then apply the pond coating just as you would a layer of paint. Just use a brush or roller, making sure you give the pond complete coverage. You can add pond paint once the pond coating is dry, and once it is all dry, you can start to add water. 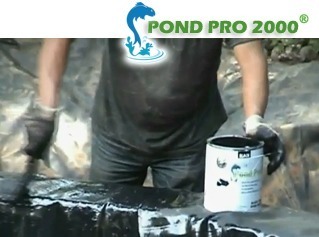 Pond coatings are a vital part of getting your pond set up properly. Make sure you have the right coating, and that you follow all the instructions on the packaging to ensure proper coverage. The thought of having a man-made pond on the property is quite nice. Even before you have started to dig a hole for the pond, you can already imagine spending a quiet day relaxing by the pond and perhaps watching koi come to the surface for a nibble of food. A water feature can be quite relaxing, and it can add a lot to the aesthetic value of your property. However, you want to make sure you reduce the risk of leaks. The following are some simple steps to guide you along the way. To ensure you are sealing a pond properly, you need to start with a properly prepared location. Once you have dug out the hole for the pond, you will want to inspect the area to make sure there are no sticks or rocks, or roots that are in the vicinity. These could eventually cause a puncture. This can be a big problem with roots, as they may start to push their way toward the pond and through the liner or concrete that you have used for the pond. Once the hole is properly cleaned out and prepared, you can move on to the next step of sealing ponds. If you are going to be sealing a pond made of concrete, you need to make sure that the concrete is fully set and cured before you begin. If you allow moisture to remain in the concrete, this is going to cause cracks and leaks latter. The usual amount of time it takes for concrete to set is four weeks, or just one week if it has an accelerator added to it. However, weather conditions could slow this process slightly. For example, if it is damp, the concrete will take longer to set. Once the liner is in place, or your concrete has been cured, it is time to clean the area thoroughly. Remove any dirt and debris from the pond. Go over it several times to make sure you have removed everything. Even a small piece of debris between the sealer and the pond could cause a leak. Sealing a pond requires the right type of sealer. Make sure you are choosing an option made especially for sealing ponds, and be sure that it is long-lasting and nontoxic. The instructions for the sealers tend to be very simple, and you will find that they go on just like paint. You can apply them with a roller or a brush. Always be sure to coat the entire pond so there is no chance of a leak. Next, you will slowly start to add water and look for any leaks. If you find any leaks, remove the water and repair the leak with the sealer, or with a patch and sealer if the leak happens to be severe. Once you are certain there are no leaks, you can fill up the pond with water and enjoy your new water feature. Naturally, you want to make sure your man-made pond is well-maintained so it continues to bring you joy for many years to come. Most of the time, you will find that ponds are easy to maintain, and they do not need to have repairs very often. However, over time, and if there is a problem with the pond, the need for repairs will arise. You will want to have a pond liner repair kit on hand in case this occurs or if you have already found a problem with your liner and need to fix it. What Should Be in the Kit? While you will find that different pond liner kits from various companies will often have different types of materials and tools in them, there tends to be some basic elements that are the same throughout. When you are shopping for a pond liner repair kit, you will want to make sure it has high-quality sealant and patches. With some repairs, you might only need to use the sealant, but many repairs will also require a patch. In addition, you will want to have a roller or brush in the kit so you can easily apply the sealant. It goes on just like paint, but you will want to have tools that you use just for the pond liner repair so you do not damage the brushes you have for other DIY tasks around the home. The kits will generally have cleaning cloths or scrubs, as well, since you need to clean the liner and remove any debris before you make the repair. One of the items that you should make sure is in the kit, or that you have on hand, is latex or rubber gloves. If you were to get the sealant on your hands, it is going to take a while before it comes off again. After all, it is supposed to be waterproof! Premade Pond Liner Repair Kits or Make Them on Your Own? Now that you have a better idea of what items should be in the pond liner repair kits, you need to decide whether you want to buy a premade kit or whether you want to put one together on your own. One of the benefits of buying a premade kit is that it will have everything you need to take care of the repair job. It is a very convenient way to get the materials you need. However, if you happen to have some extra pieces of liner and a roller, then it might be easier for you to simply buy some sealer, brushes, and gloves and make your own kit instead. Do whichever is most convenient and cost-effective for you. Even if you do not have any issues with your liner right now, you will want to consider having one or two of these pond liner repair kits on hand, just in case you need them in the future. If you are considering creating a fish pond on your property, or if you already have a man-made fish pond on your property, you need to make sure it is built correctly and cared for properly. 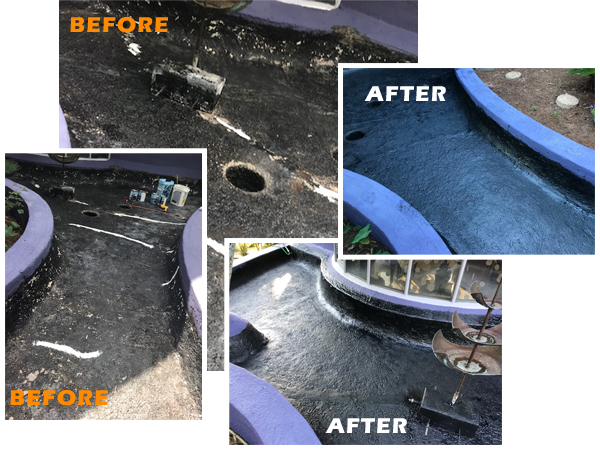 One of the problems that could present itself is a leak, but you can vastly reduce the risk of leaks when you are using a proper fish pond coating for the job. Not only do you need the right coating, but it also needs to be applied properly. Let’s look at some simple tips you will want to keep in mind when you are adding your fish pond coating. They will help you to enjoy a problem-free pond for years to come. One of the common mistakes made when coating a pond by those who have never done it before is getting ahead of themselves. They want to have their pond completed, so they do not take the time needed to let everything set up properly. This can cause major problems. Just because the concrete might appear dry and set does not mean that it is ready. You will generally have to wait four weeks for concrete to set if it does not have an accelerator added to it, or one week if it does have an accelerator. Trying to use the fish pond coating before this time could trap moisture in the concrete. This moisture will later cause cracks to form. If it freezes in your area, the cracks could become even larger and more difficult to repair. Always wait the appropriate time to make sure the concrete has cured. Just as you need to make sure that the concrete is cured, you also need to make sure you are not applying the fish pond coating when the weather is rainy or damp. Again, this is because of the dangers that moisture represents when it is trapped between the concrete and the sealer. Always wait until it the concrete is dry and the weather is nice before you apply the sealer. In addition to the dampness, you also need to think about the cold. Many of the top products on the market recommend that you only apply the sealer when the temperature is above 50 degrees F. While it might still cure if the temperatures are lower, it tends to take longer. When you are applying the fish pond coating, you need to make sure that all the areas of the pond have been coated. If you were to miss even just a small piece within the pond, you are setting your pond up for leaks in the future. Check the pond before adding water to make sure you covered it all. Always follow the instructions from the manufacturer on the packaging of the fish pond coating to make sure it will adhere properly and provide you with the protection your pond needs.